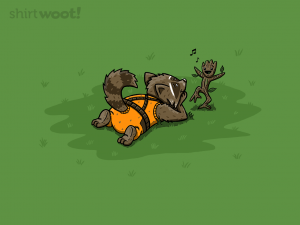 I’m not sure Rocket Raccoon would like to be depicted in such a vulnerable position as this. On the other hand, it is absolutely adorable. Almost as adorable as Baby Groot himself. How much do you wanna bet Rocket has a bomb detonator in front of him that he’s tinkering with while watching Baby Groot dance? I am totally going to wrap this cloth around my torso for Easter. I’m sure my mom won’t mind me showing up at church in this. Right?